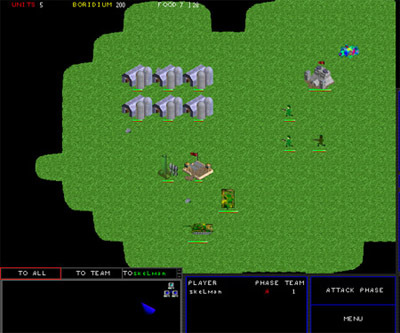 Skirmish is a multiplayer turn based strategy game. 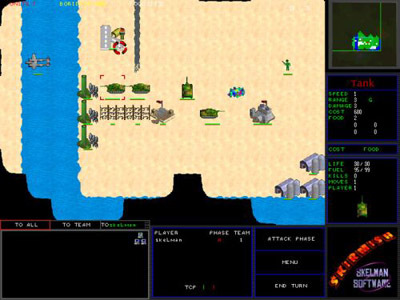 You mine boridium, create soldiers, tanks, bombers, and mortars, while trying to expand your power in the game. Find more boridium, and destroy any enemy in your path. 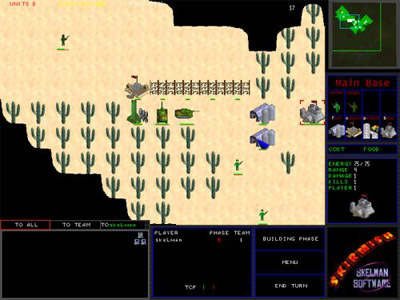 3D-like sprites were added to the game in a graphical reworking that significantly improved the overall look. The gameplay is fun, and the animations and sound effects will keep you smiling. This game will never be completed or sold, but it was a good learning experience for me. The public, no-strings-attached beta is available for download. You can play up to 6 players over TCP/IP. Released on March 23, 2001. A desert battle near the water. To download Skirmish beta v2.2, visit the download page. You can get it here. The old site with information on the game, how to play, units, and other screenshots can be visited here.